Salt, the most indispensible food ingredient in the kitchen is also a cause of concern when consumed beyond the healthy limit. Other than its association with high blood pressure, high intake of salt is also associated with other health problems. Salt which is basically sodium chloride is 40% sodium and 60% chloride. It is the sodium, which in excess causes harm to most of the organs of the body. Our minimum requirement of sodium for normal body functioning is around 500mg which is about 1.25g of salt. On an average, we consume 8.5 to 9g of salt per day as against 5g (1 teaspoon) which is recommended by the WHO. The reason behind these guidelines is due to the effect of excess salt consumption on our health. High salt intake is detrimental to most organs of the body. Here are some of the health hazards associated with high sodium in the diet. Coronary Heart Disease: Coronary heart disease is a term used when the blood supply to the heart is restricted or blocked leading to a heart attack or heart failure. Raised blood pressure is the major risk factor for coronary heart disease. High blood pressure causes blood vessel walls to thicken and narrow which reduces blood supply to the heart. This can be a cause of heart failure where the heart is unable to supply enough blood to the body. If the blood vessels become too narrow and blood supply is completely restricted, it could lead to a heart attack. As raised blood pressure is a major risk for coronary heart disease, lowering blood pressure by reducing salt intake dramatically reduces the risk. Also reduced salt intake would mean lowered water retention and lower blood volume and so lesser pressure on the heart to pump blood throughout the body. Stroke: High blood pressure can also cause the atherosclerotic plaques in the blood vessels causing them to rupture. This can lead to clot formation. If this blood clot travels to the blood vessel supplying blood to the brain and blocks the vessel, it can lead to stroke or dementia caused as a result of the stroke. Osteoporosis: Osteoporosis is a condition wherein the bones become weak and brittle. The amount of calcium lost in the urine increases as the salt in the diet goes up. If blood levels of calcium are low, calcium is leached out of the bones. This is one of the causes of Osteoporosis where the bones become porous due to calcium being leached out of them. 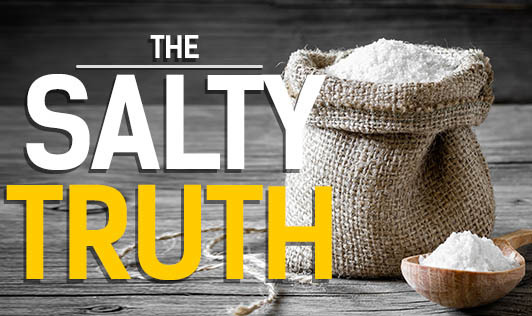 Reducing salt intake causes a positive calcium balance as less calcium is lost in the urine. Kidney Stones & Kidney Disease: Kidney stones are formed due to the buildup of calcium in the kidney. High salt intake and high blood pressure can cause excess calcium to be excreted by the kidneys into the urine, which subsequently leads to buildup of calcium causing kidney stones. These could be very painful and can lead to kidney diseases. High blood pressure also puts a strain on the kidneys leading to kidney disease. In case of kidney disease, again sodium needs to be restricted due to inability of the diseased kidneys to maintain fluid and salt balance. So keeping salt to a minimum is best to avoid any kidney issues. Salt may be unavoidable and while that extra pinch may not seem a lot right now, avoiding it could do lots of good to your body. It is best to keep a salt check and stay within limits of restricting salt intake to 1 teaspoon a day or lower if there is existing hypertension to keep your body healthy and damage free.